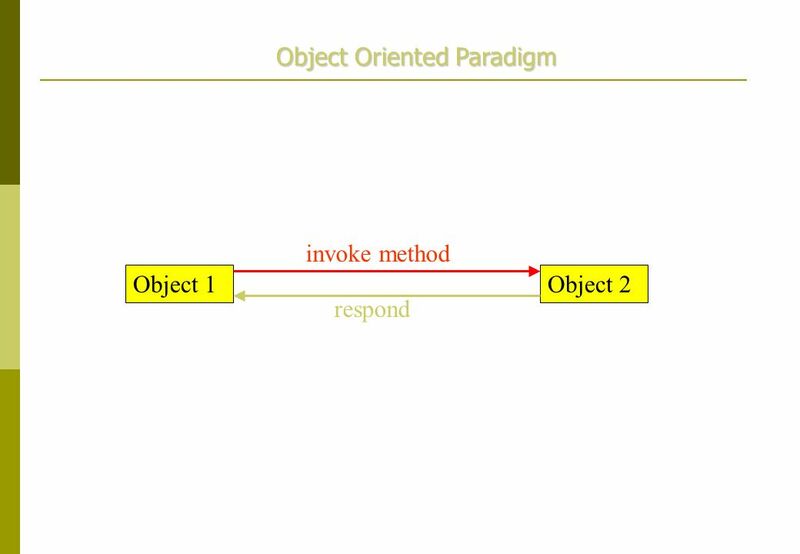 Distributed Objects Remote Method Invokation: Conceptual model. 22 Server It is not necessary to have a thread wait to keep the server alive. 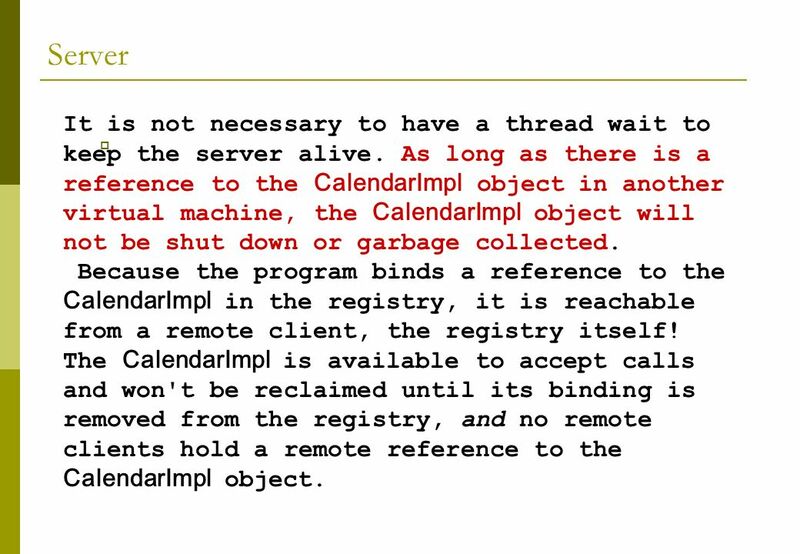 As long as there is a reference to the CalendarImpl object in another virtual machine, the CalendarImpl object will not be shut down or garbage collected. 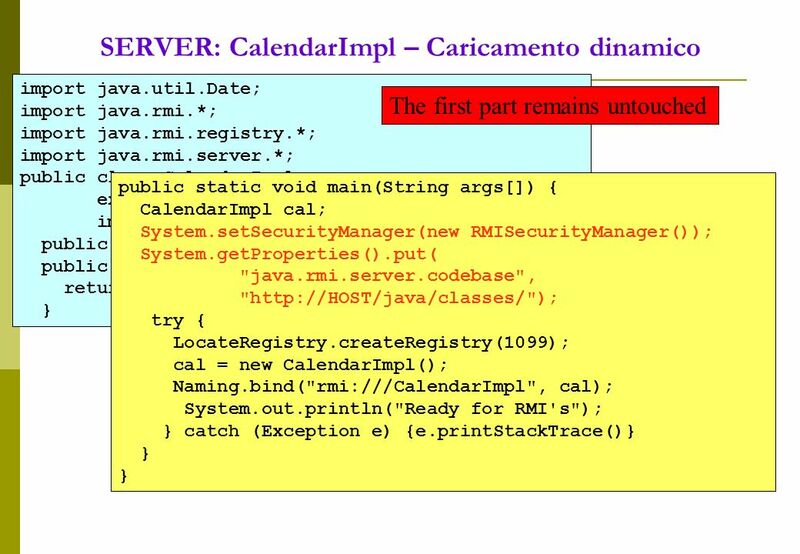 Because the program binds a reference to the CalendarImpl in the registry, it is reachable from a remote client, the registry itself! The CalendarImpl is available to accept calls and won't be reclaimed until its binding is removed from the registry, and no remote clients hold a remote reference to the CalendarImpl object. 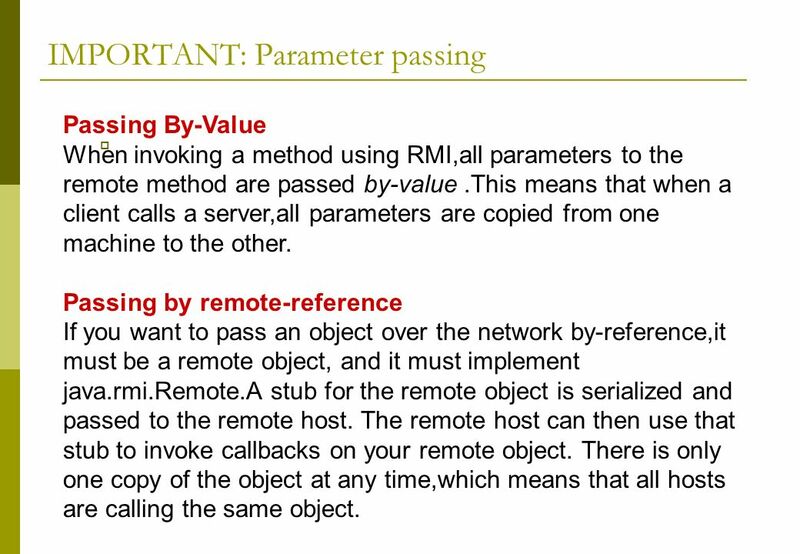 31 IMPORTANT: Parameter passing Passing By-Value When invoking a method using RMI,all parameters to the remote method are passed by-value.This means that when a client calls a server,all parameters are copied from one machine to the other. 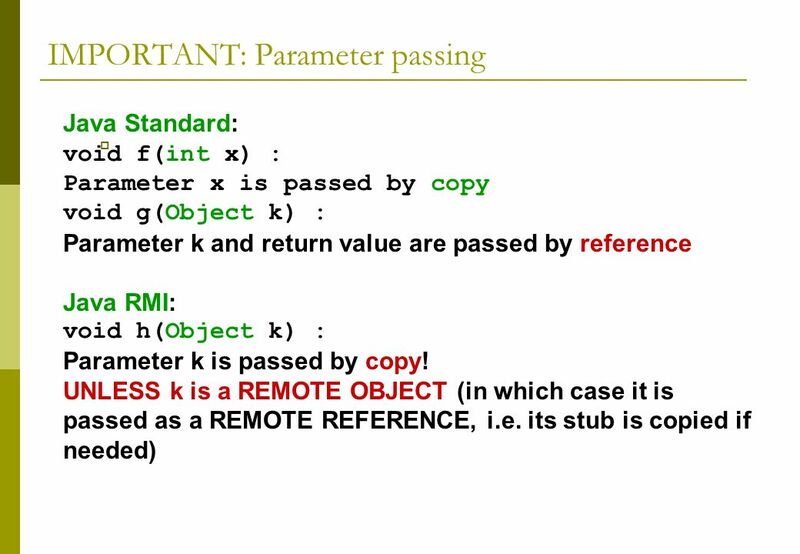 Passing by remote-reference If you want to pass an object over the network by-reference,it must be a remote object, and it must implement java.rmi.Remote.A stub for the remote object is serialized and passed to the remote host. 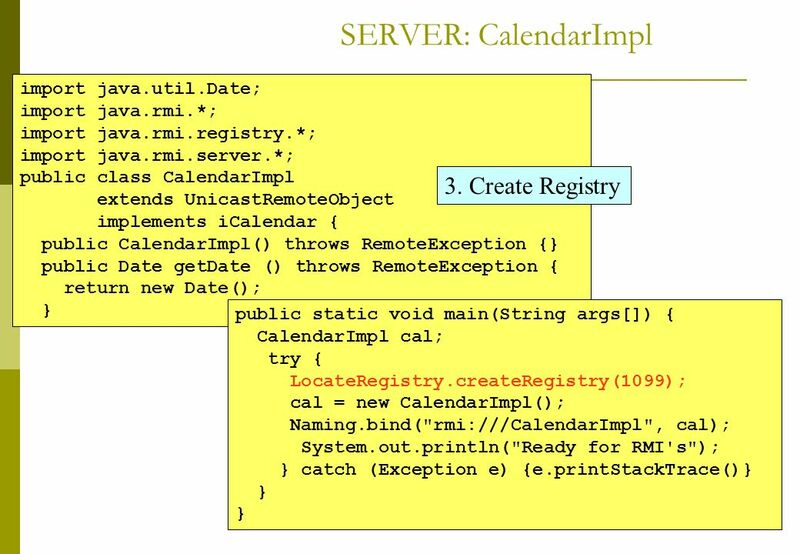 The remote host can then use that stub to invoke callbacks on your remote object. 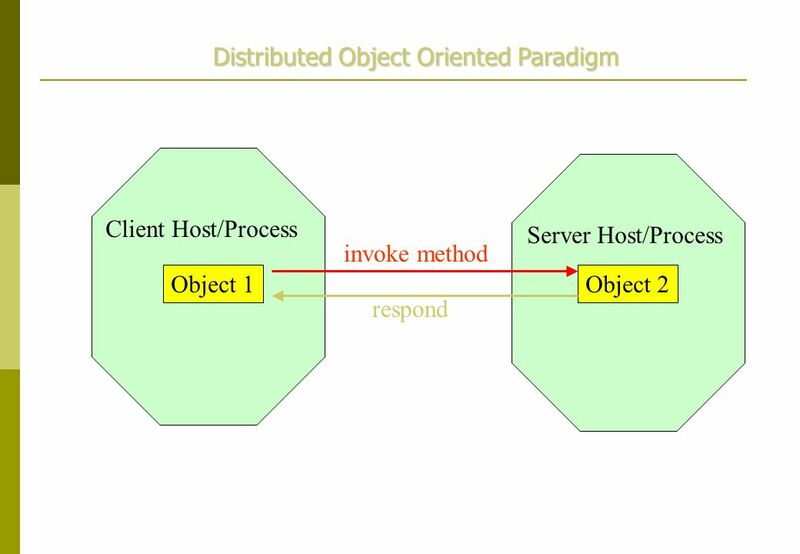 There is only one copy of the object at any time,which means that all hosts are calling the same object. 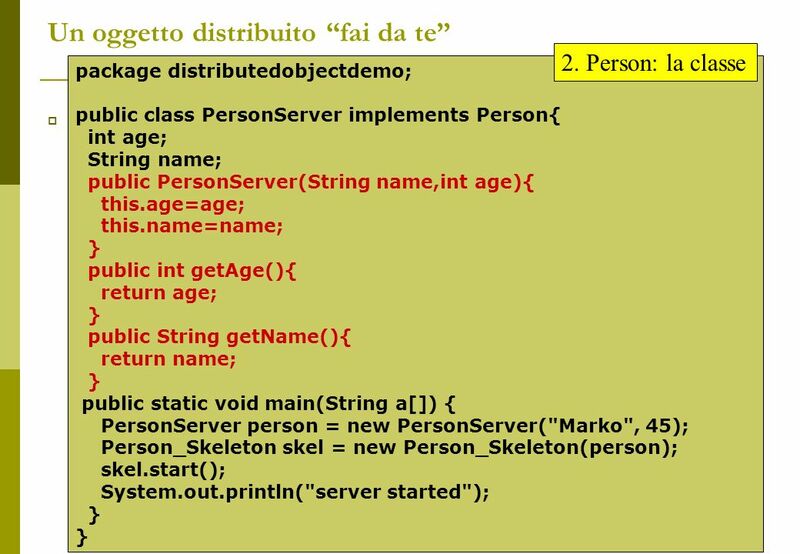 32 Serialization Any basic primitive type (int,char,and so on) is automatically serialized with the object and is available when deserialized. 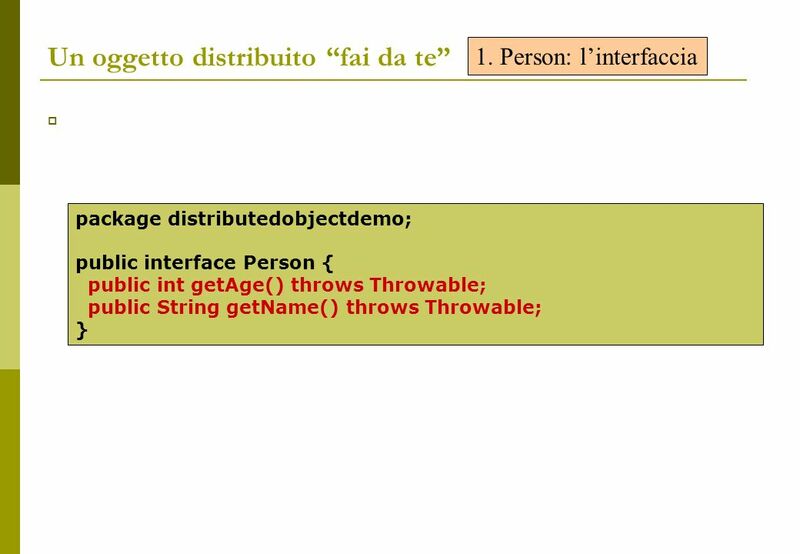 Java objects can be included with the serialized or not: Objects marked with the transient keyword are not serialized with the object and are not available when deserialized. 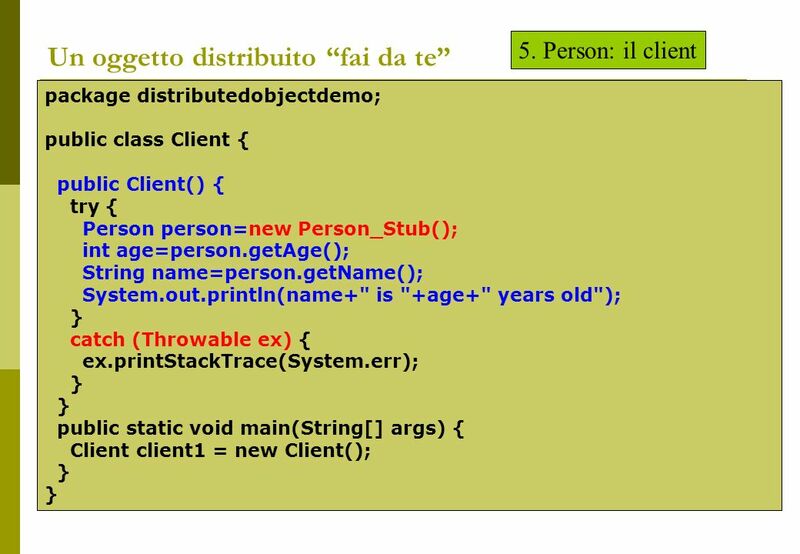 Any object that is not marked with the transient keyword must implement java.lang.Serializable.These objects are converted to bit-blob format along with the original object. 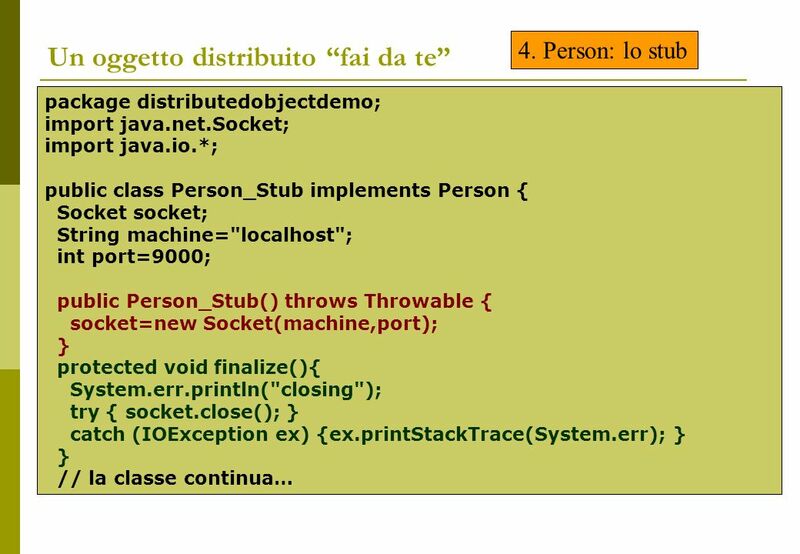 If your Java objects are neither transient nor implement java.lang.Serializable,a NotSerializable Exception is thrown when writeObject()is called. 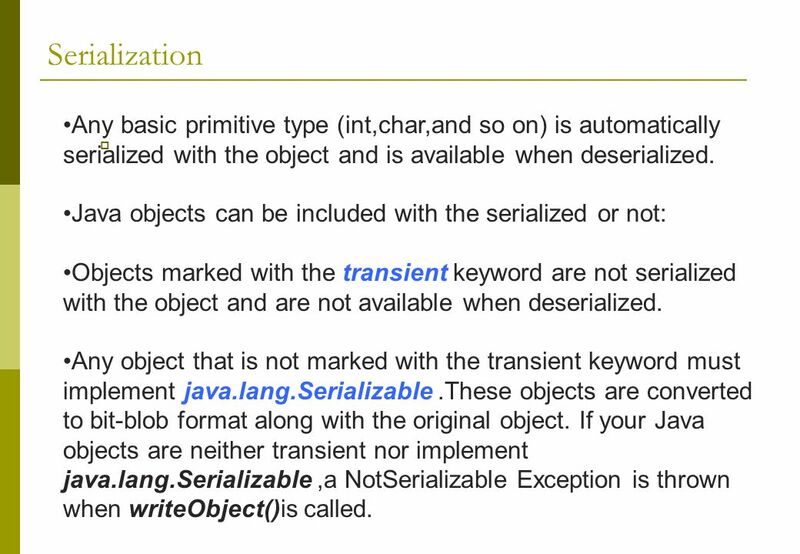 33 When not to Serialize The object is large.Large objects may not be suitable for serialization because operations you do with the serialized blob may be very intensive. 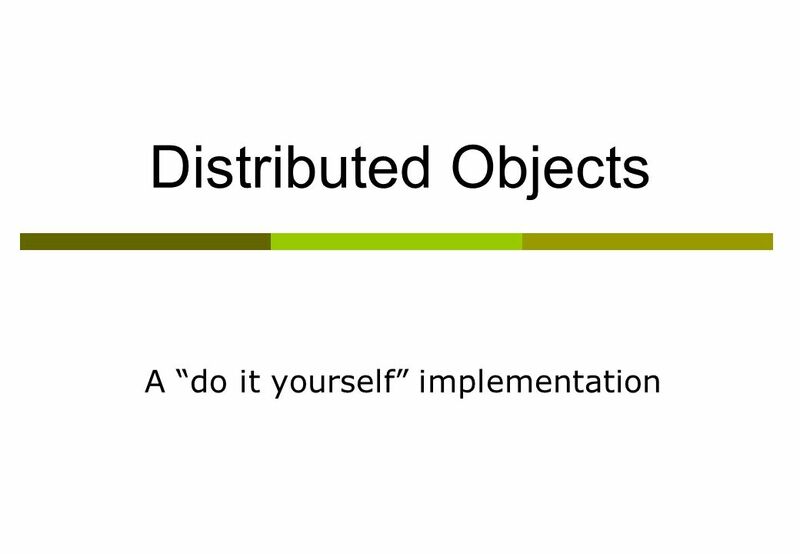 (one could save the blob to disk or transporting the blob across the network) The object represents a resource that cannot be reconstructed on the target machine.Some examples of such resources are database connections and sockets. 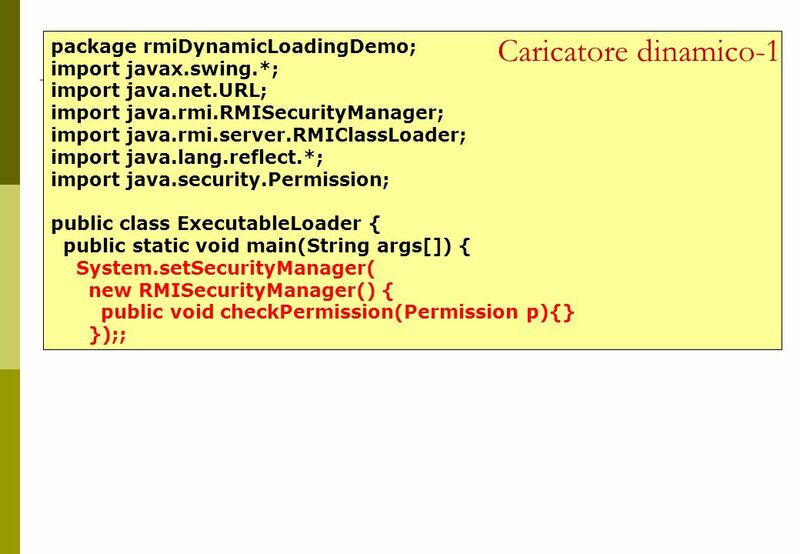 The object represents sensitive information that you do not want to pass in a serialized stream..
35 RMI-IIOP RMI-IIOP is a special version of RMI that is compliant with CORBA and uses both java.rmi and javax.rmi. 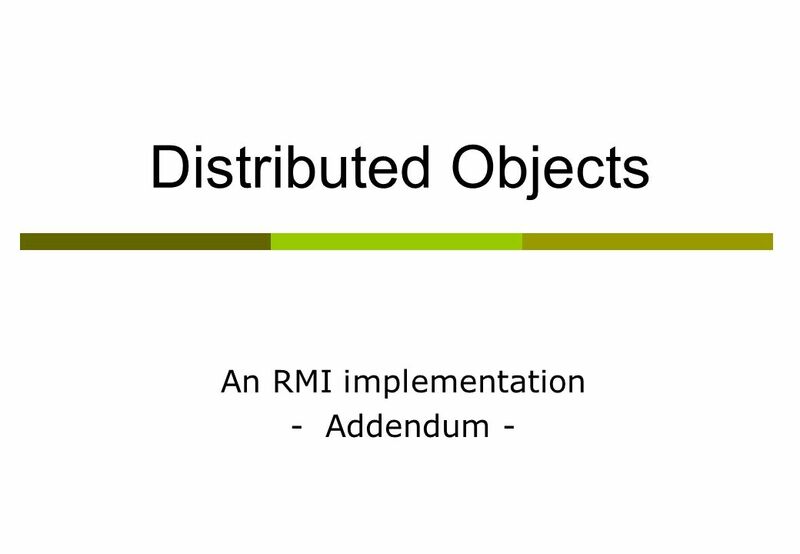 RMI has some interesting features not available in RMI- IIOP,such as distributed garbage collection, object activation,and downloadable class files. 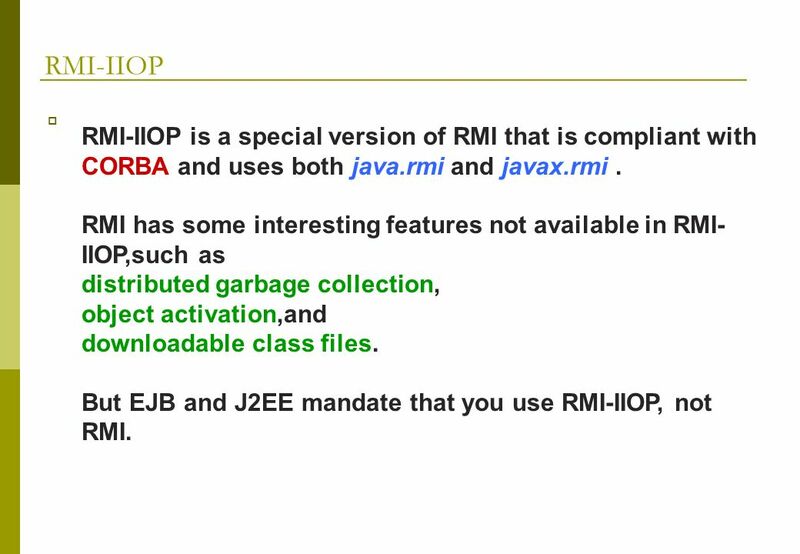 But EJB and J2EE mandate that you use RMI-IIOP, not RMI. 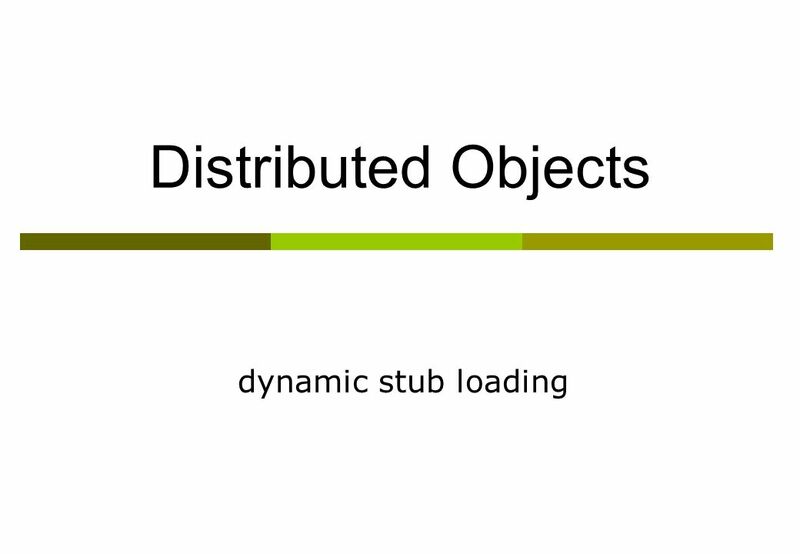 37 Alternative 2 – stub dynamic loading Instead of manually copying the stub from the Server to client, can we automatically load the stub at runtime? 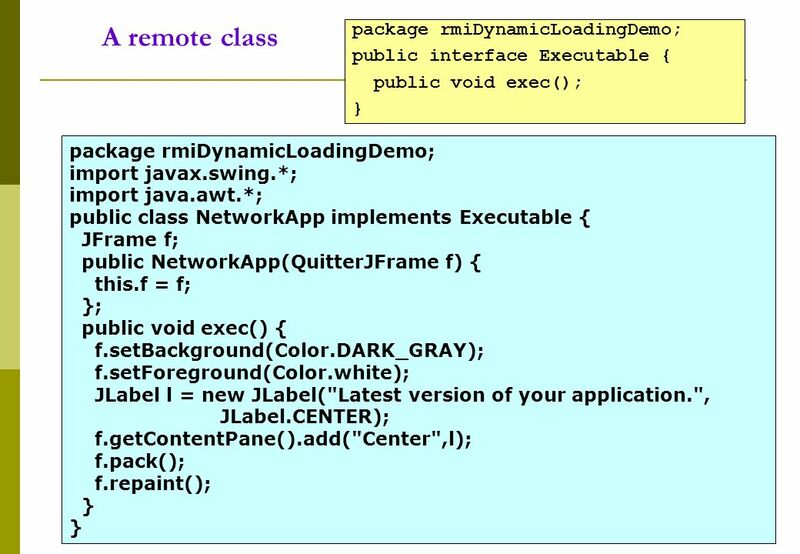 RMI can download the bytecodes of an object's class if the class is not defined in the receiver's virtual machine. 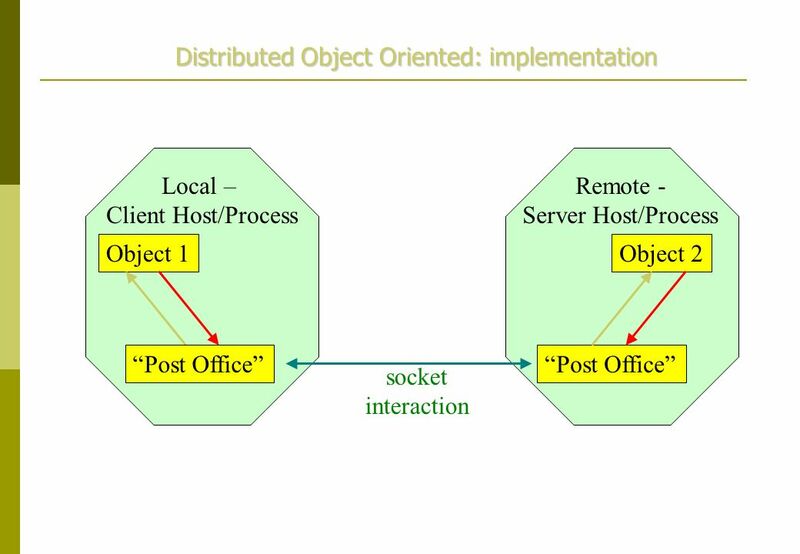 The types and the behavior of an object, previously available only in a single virtual machine, can be transmitted to another, possibly remote, virtual machine. 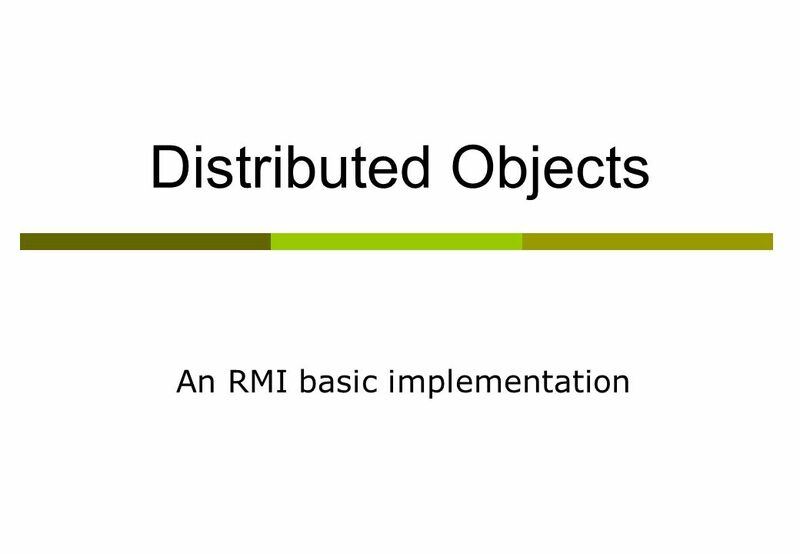 RMI passes objects by their true type, so the behavior of those objects is not changed when they are sent to another virtual machine. 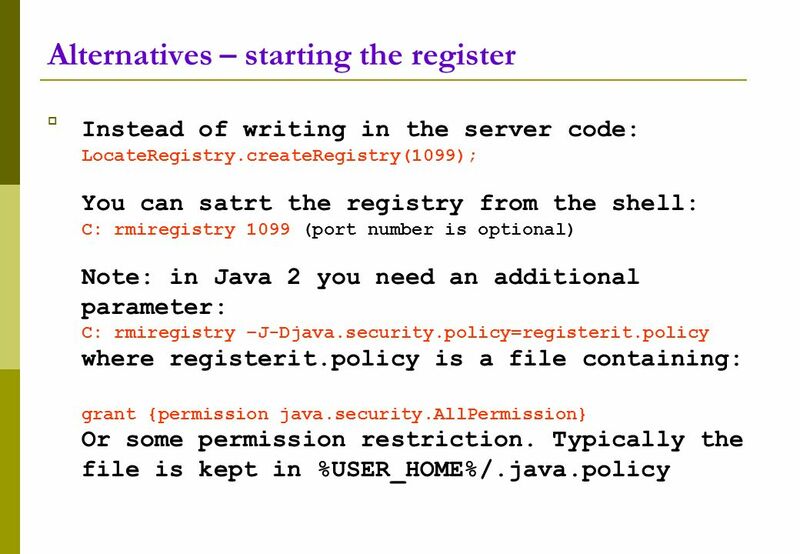 This allows new types to be introduced into a remote virtual machine, thus extending the behavior of an application dynamically. 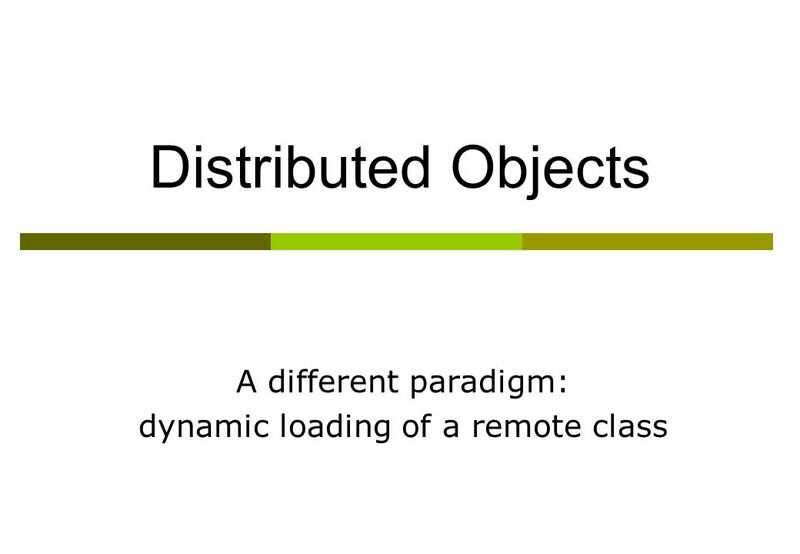 42 Dynamic loading of a remote class Object 1 Class 2 1. 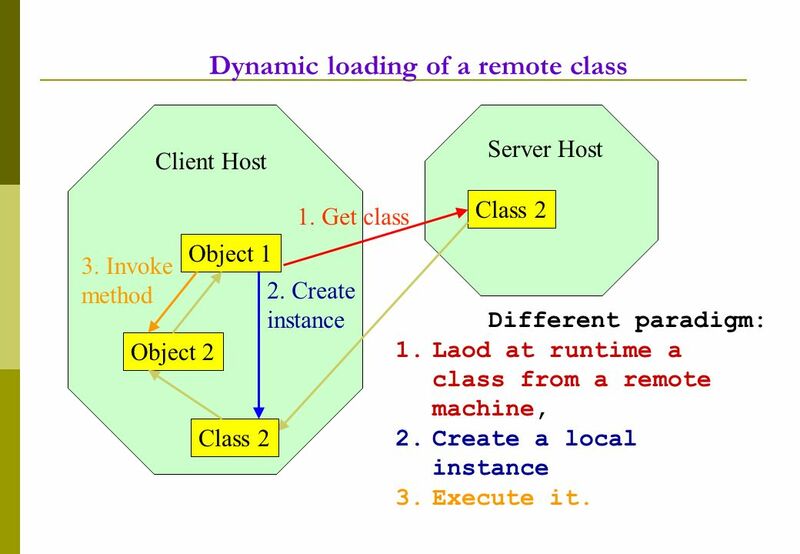 Get class Client Host Server Host Class 2 Object 2 2. 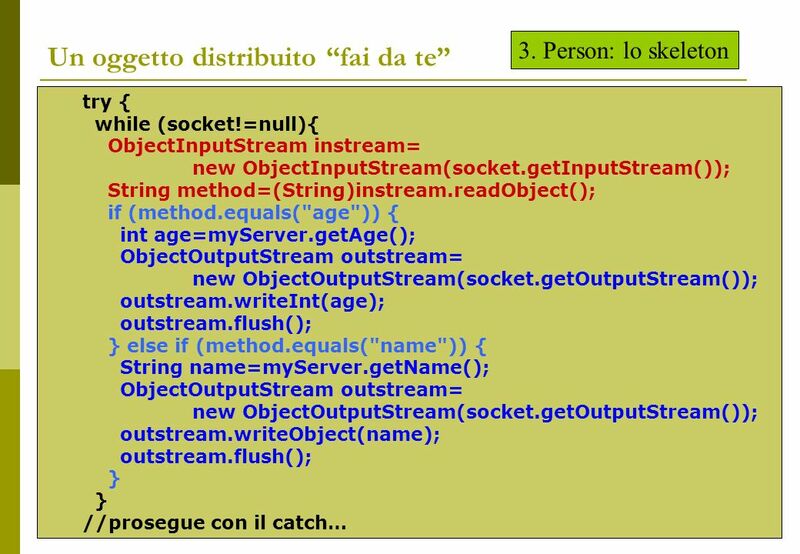 Create instance 3. 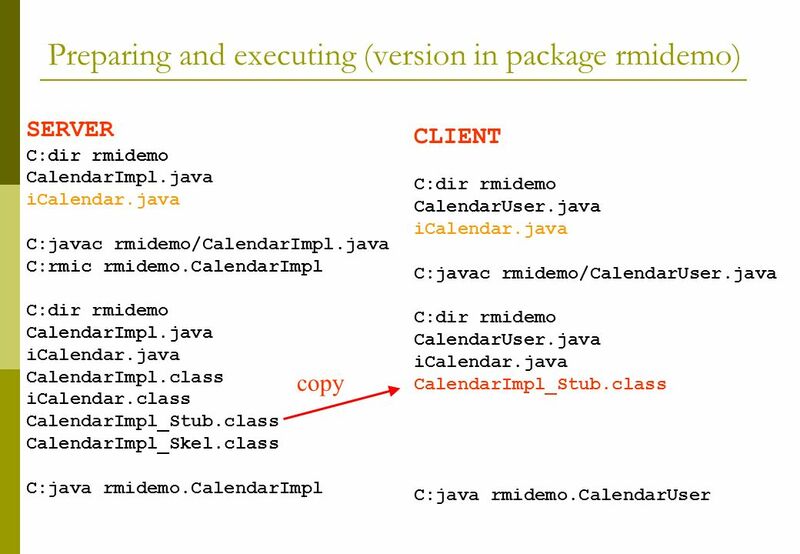 Invoke method Different paradigm: 1.Laod at runtime a class from a remote machine, 2.Create a local instance 3.Execute it. 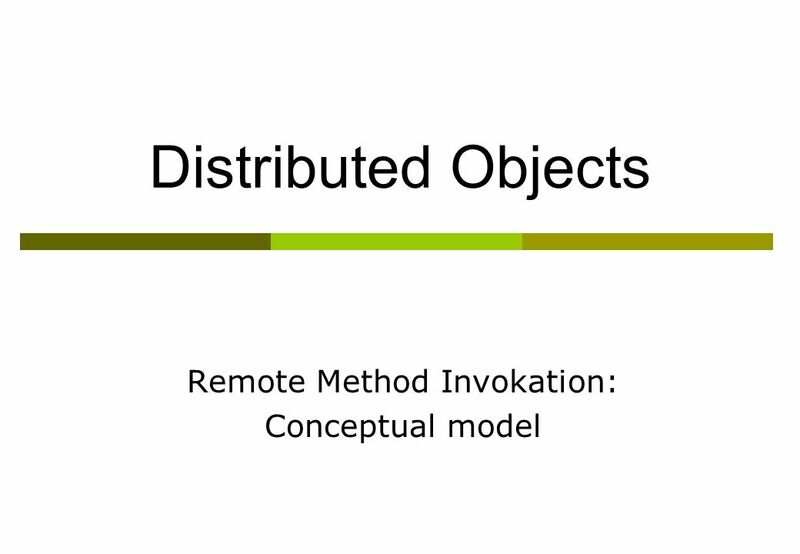 Download ppt "Distributed Objects Remote Method Invokation: Conceptual model." 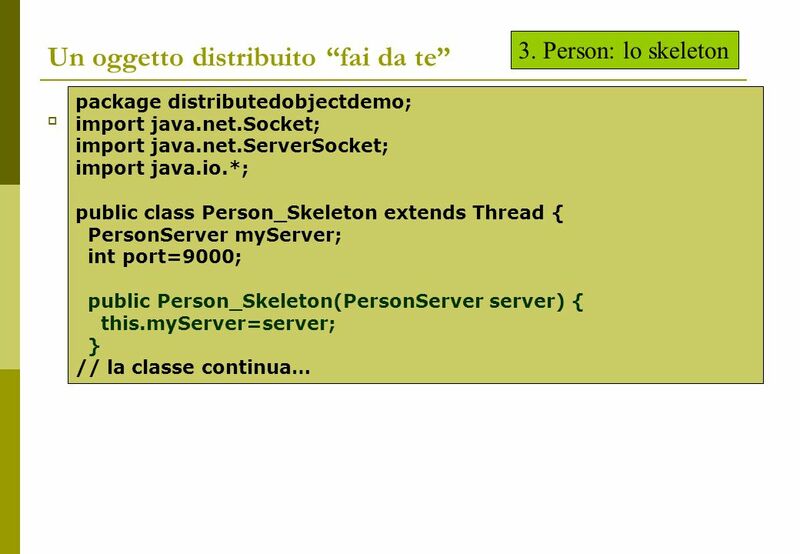 Corso di Formazione Sodalia Enterprise Java Beans Distributed Objects Remote Method Invokation. What is RMI? 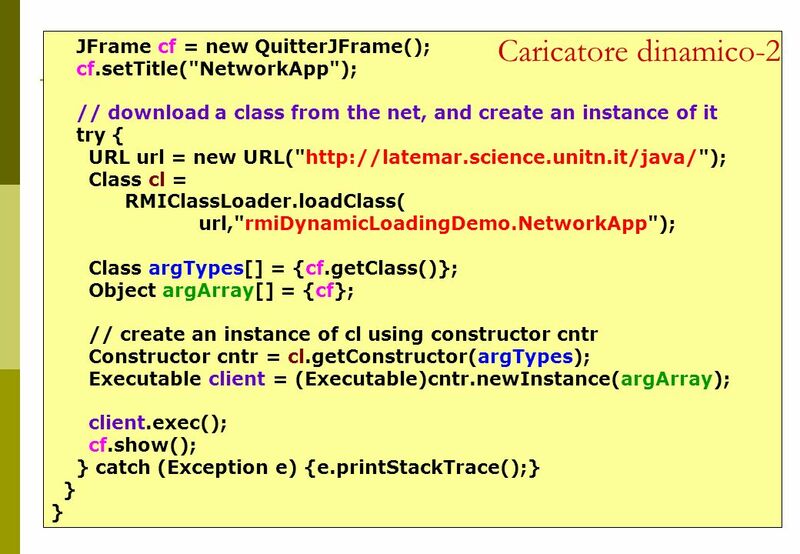 Remote Method Invocation –A true distributed computing application interface for Java, written to provide easy access to objects existing. RMI Varun SainiYing Chen. What is RMI? 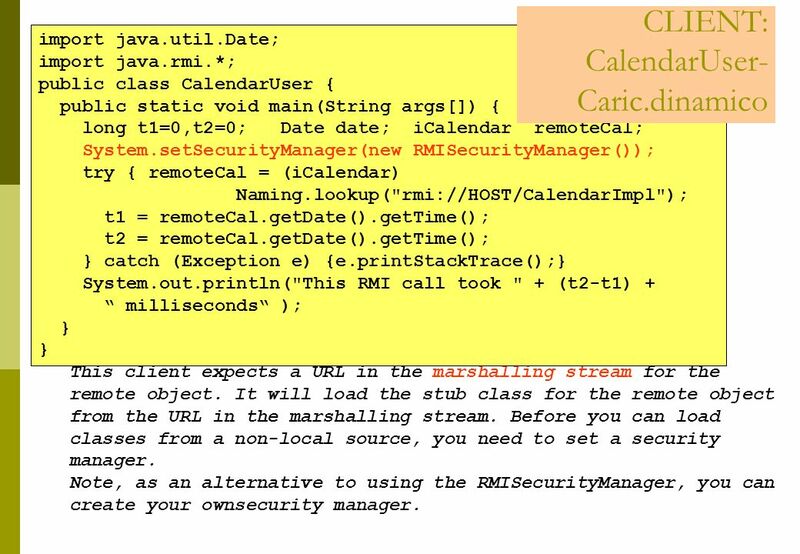 RMI is the action of invoking a method of a remote interface on a remote object. It is used to develop applications. 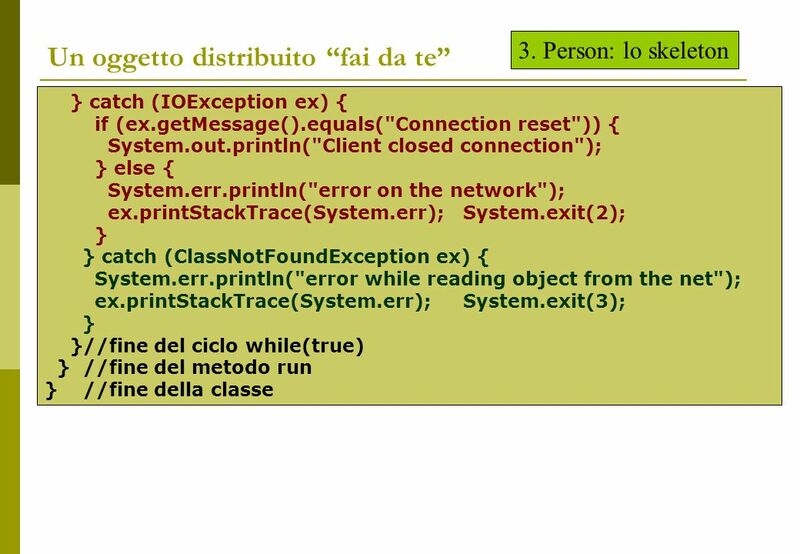 Spring/2002 Distributed Software Engineering C:\unocourses\4350\slides\DefiningThreads 1 Serialization Flatten your object for automated storage or network. 1 Chapter 9 Network Programming. 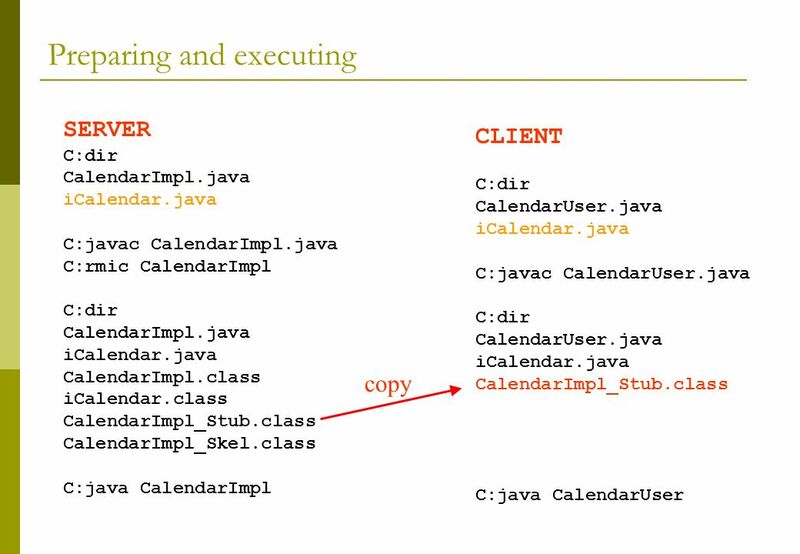 2 Overview Java has rich class libraries to support network programming at various levels. There are standard classes. 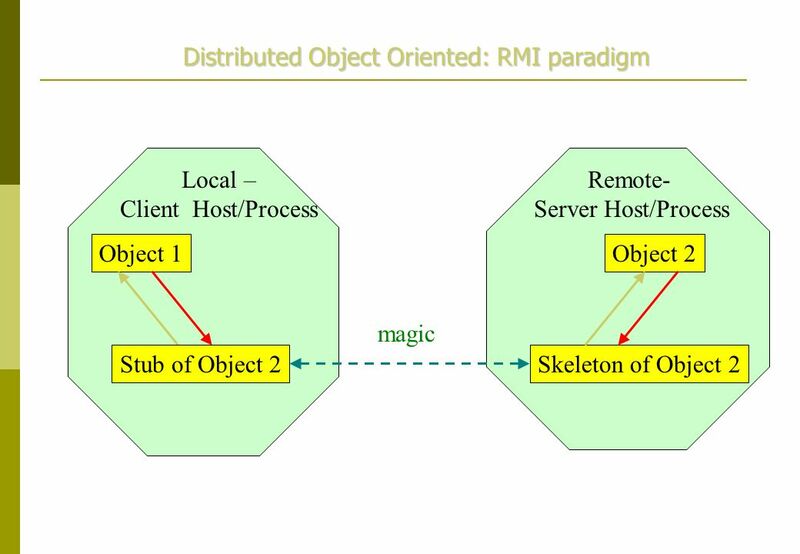 Copyright © 2001 Qusay H. Mahmoud RMI – Remote Method Invocation Introduction What is RMI? 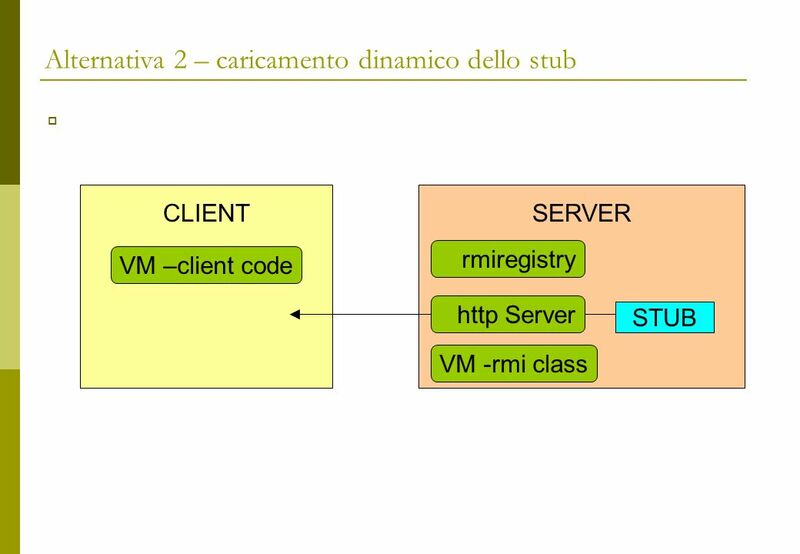 RMI System Architecture How does RMI work? 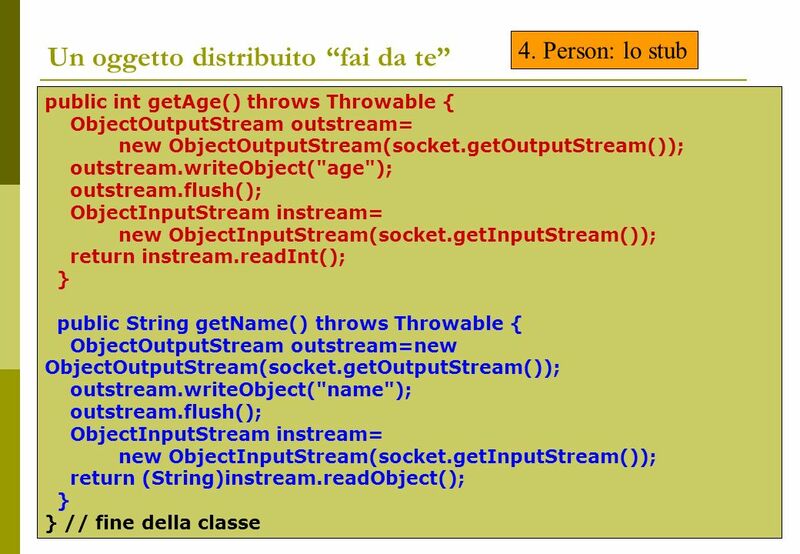 Distributed Garbage. 15-May-15 RMI Remote Method Invocation. 2 “The network is the computer” Consider the following program organization: If the network is the computer, we. 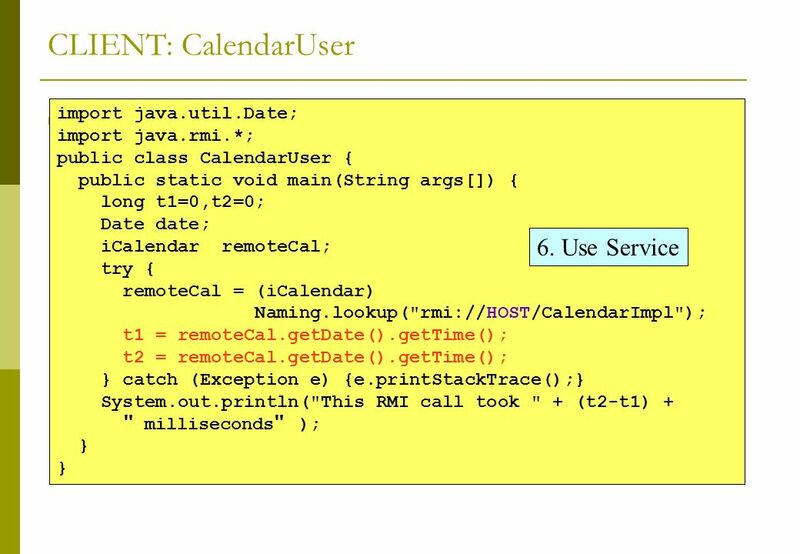 Java Remote Method Invocation (RMI) In Java we implement object systems: O1O2 O3 thread 1thread 2 execution scheme JVM 1JVM 2 distribution scheme. 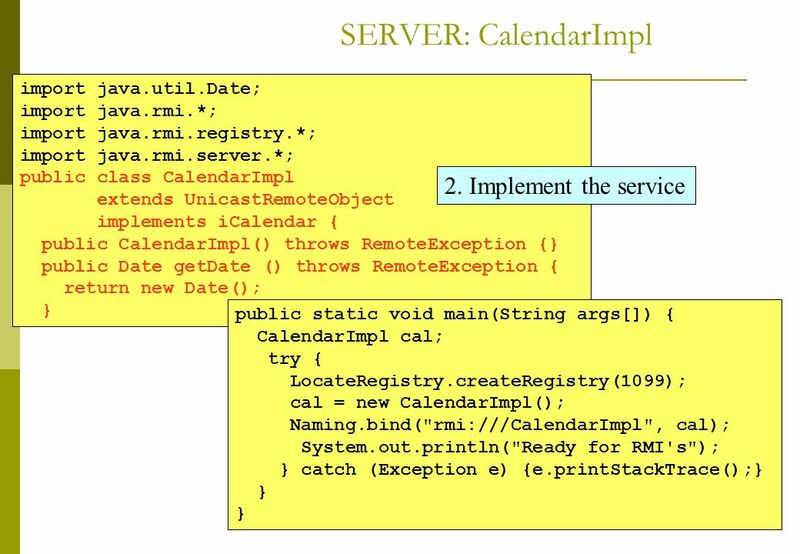 Java Remote Object Invocation (RMI) Overview of RMI Java RMI allowed programmer to execute remote function class using the same semantics as local functions. Remote Object Invocation Tran, Van Hoai Department of Systems & Networking Faculty of Computer Science & Engineering HCMC University of Technology. 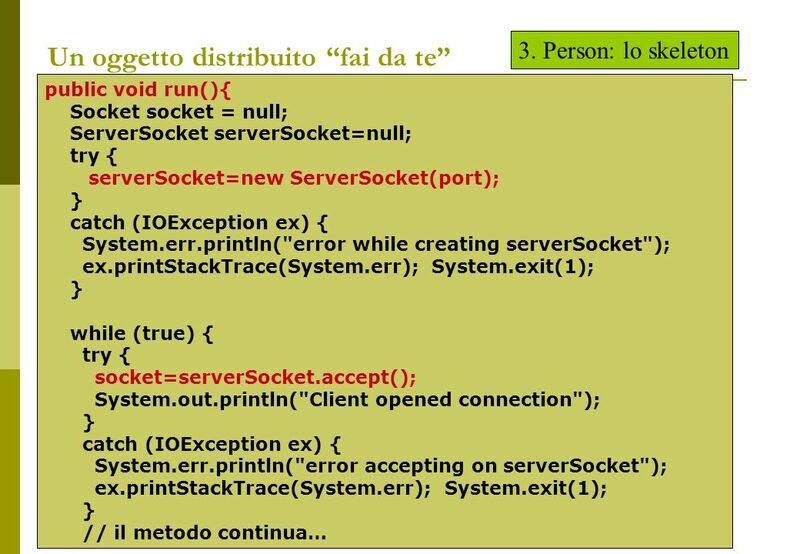 Changing the way of designing distributed applications Communication oriented design: FIRST design the communication protocol for the distributed system. FONG CHAN SING (143334) WONG YEW JOON (143388). 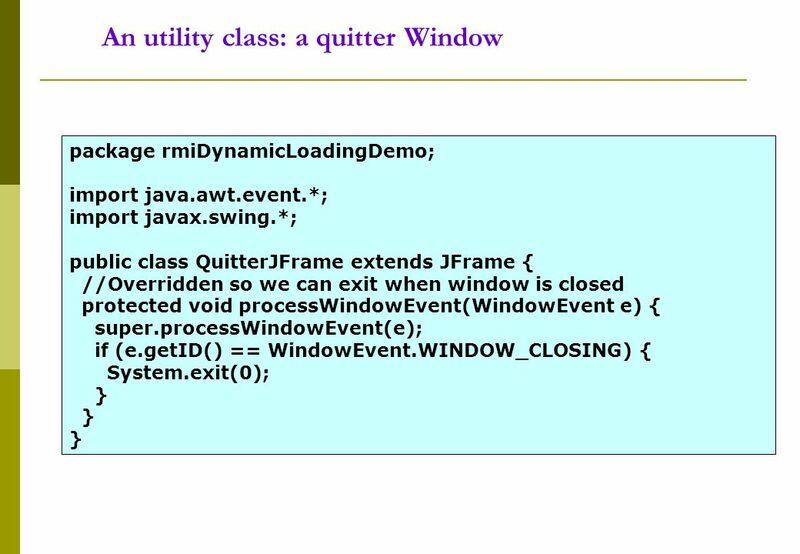 JAVA RMI is a distributive system programming interface introduced in JDK 1.1. A library that allows an. Remote Method Invocation Chin-Chih Chang. 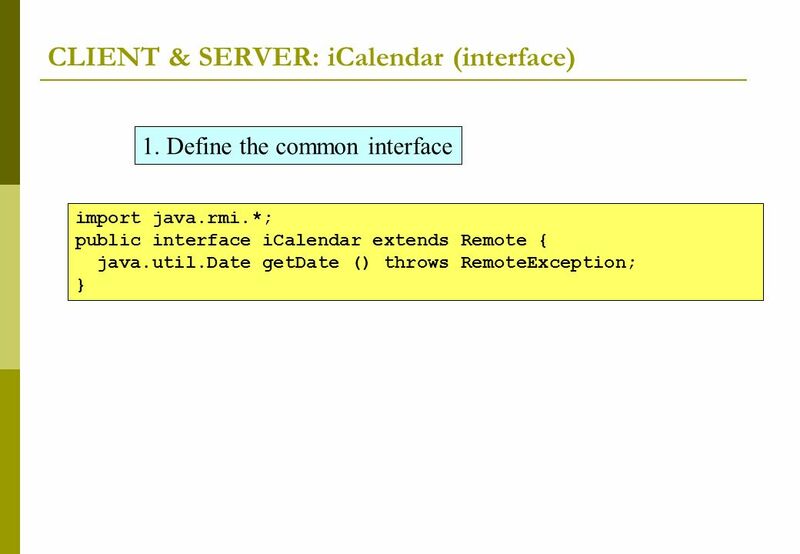 Java Remote Object Invocation In Java, the object is serialized before being passed as a parameter to an RMI. 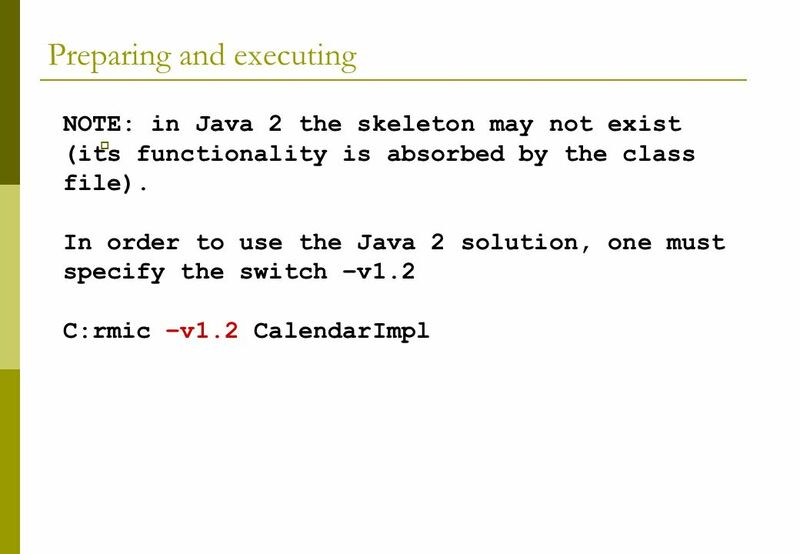 How Does Remote Method Invocation Work? 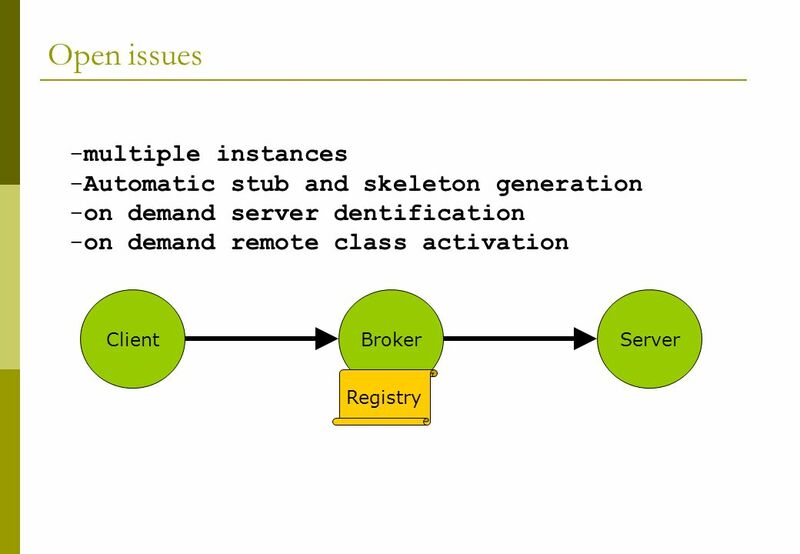 –Systems that use RMI for communication typically are divided into two categories: clients and servers. A server.